My Big Brothers Big Sisters’ Little, Jordyn, shares a few smiles and laughs with me at our 2018 end-of-year celebration. For the past six years, I have developed a passion for giving back to the community. I believe it’s a great way to bring people together. That’s why I wanted to share my experiences with a few organizations that mean so much to me. I hope my experiences will be a catalyst for you to give back to your community. As I have seen firsthand, no effort is too small. In fact, the start of the new year is the perfect time to commit to volunteering in your community. Martin Luther King Day of Service is right around the corner. Don’t know where to start? Check out this list of local volunteer opportunities. Commit to one day of giving back, and I just know you’ll be hooked! In 2012, I first became involved with MANNA (Metropolitan Area Neighborhood Nutrition Alliance) through Future Blue Leaders (FBL), an IBX Associate Resource Group. MANNA is an organization that provides medically tailored meals and nutrition education for people with serious illnesses who need nourishment to heal. FBL did a one-time volunteer event at MANNA which I attended, and afterwards, I said, “Why don’t we do this monthly?” So, I started coordinating this for FBL through Blue Crew, the corporate volunteer program for associates at Independence Blue Cross. The thing I love most about MANNA is that it is easy and fun. I can walk there after work and talk with colleagues while helping other people. I always have great conversations while doing food prep at MANNA. I also enjoy that it is an assembly line and you figure out what you are doing right when you walk in the door. Plus, as a bonus, I have learned useful kitchen skills, like the correct way to chop an onion and the proper way to use a knife. Even through the onion tears, I kept going back. A little over a year ago, I finished my master’s degree and I found myself with more free time on my hands and wanted to fill it. Although I love my time at MANNA, I wanted to diversify my volunteer experience, so I was looking for something new. I went to a Blue Crew information session and Big Brothers Big Sisters (BBBS) tugged at my heartstrings. When I first began with BBBS, I was matched with a high-school freshman. She’s now halfway through her sophomore year and I’ll continue working with her throughout her high school career. 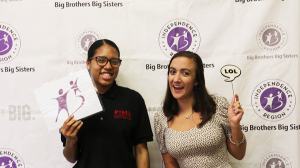 The BBBS program is a combination of a weekly online program and monthly in-person meetings. At the beginning of each session, the “Bigs” and “Littles” have open time to connect and catch up on each other’s lives. Then, there is a weekly and monthly curriculum that focuses on goals and growth behaviors. We also have structured activities such as résumé writing. One of the main purposes of the curriculum is to help the Littles make themselves more attractive college candidates. Celebrating end-of-year successes with my Big Brothers Big Sisters’ Little, Jordyn. As part of the program, the Littles set ambitious goals for themselves. My Little is very engaged and wants to excel in school. Her goals include attending a prestigious college and living abroad in France someday. I’m very proud of her. Not only does she write and speak very well, but she’s also driven and knows which colleges she wants to apply to and what career path she wants to pursue. I am currently helping her secure a job for next summer. We’re talking about her skill set and how to translate that to her résumé. I tell her about my own work experience and relate how I used my high school jobs to get a job during and after college. One of the things I love about volunteering at BBBS is that you see the direct impact you are making in someone’s life. When we first started working on the résumé-building unit, my Little was disinterested in the activities that we worked on. She had it set in her mind that she didn’t need a résumé for any of the jobs she was considering for the summer. I think I succeeded in getting her to see that even if the jobs she is applying for right now don’t require a résumé, she would stand out from the crowd by providing one anyway. In addition, she has come to realize that even if she doesn’t need a résumé for the job she wants now, she will need one in the future. I feel like my advice is working because she is showing an increased interest in perfecting her résumé recently! Even though I am the mentor, I get so much out of my interactions with my Little. If I’ve had a difficult or stressful day, I always feel better after I see her. In addition to BBBS and MANNA, over the holidays, I coordinated the IBX sales team’s adoption of a family through Bringing Hope Home. My family and I also adopt families through this program. One of the reasons I like this organization is that it makes giving very personal. The first time that I told my parents I adopted a family in their name, they cried because they believe so strongly in giving back. My parents are also very involved in volunteering, especially within the medical community. In fact, my dad is a translator for the uninsured via Community Volunteers in Medicine (CVIM) and served on their board for nine years. One of my personal goals is to get more involved with CVIM. I’m proud to work for a company that lives its mission of enhancing the health and well-being of the people and communities we serve. 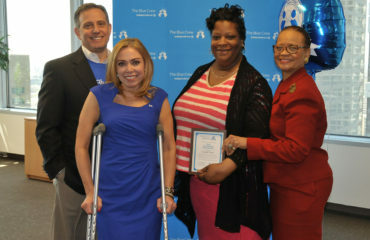 IBX is heavily involved in community volunteerism, and not just on a corporate level. 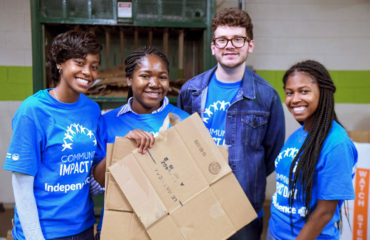 Although IBX supports the community through programs, events, and offerings, many IBX employees also actively volunteer and give up their personal time to give back to the community. 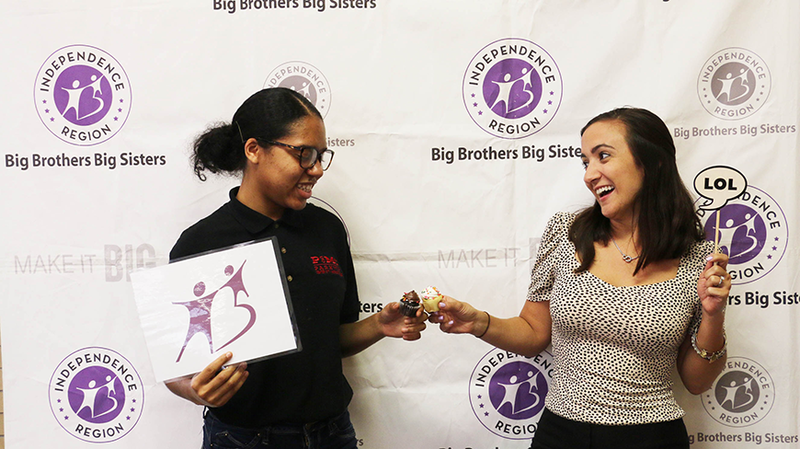 If you’re interested in becoming a BBBS mentor, you can fill out an application. If you are interested in other volunteer opportunities through BBBS, you can contact Calista Condo. Interested in MANNA? Visit their website for more information. If you’re interested in volunteering with Bringing Hope Home, their website offers information on how to get involved in their Adopt-a-Family program around the holidays or other year-round volunteer opportunities. CVIM also offers information on their website on how to get involved with their organization. Monica Fox is a Senior Account Executive on the Premier Accounts Retention team at Independence Blue Cross. In her current role Monica is responsible for an assigned book of business including large local and national accounts with over 1000 employees.